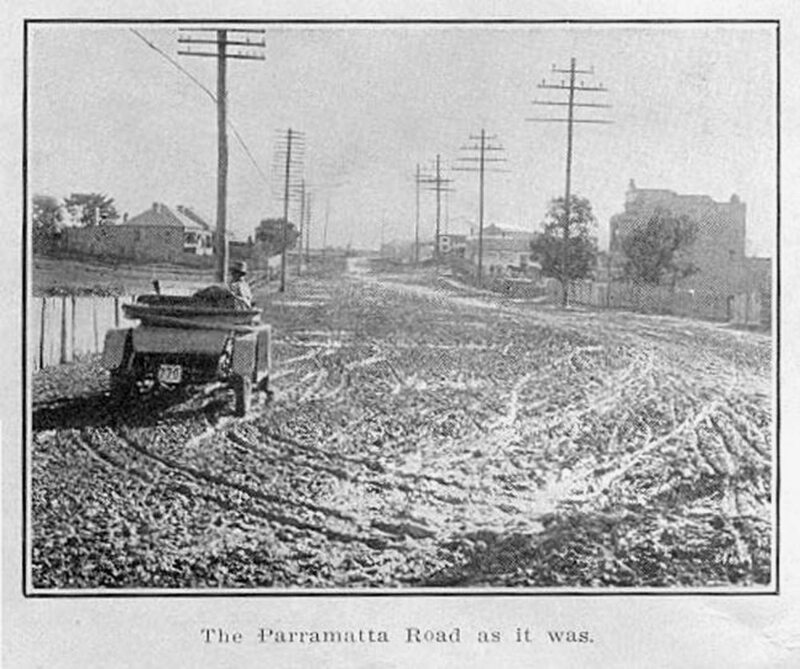 Parramatta Road witnessed a sight on April 16, which was unique in the history of the roadway. It was that of nearly 1,000 motor cars laden with passengers whose faces were wreathed with smiles of satisfaction. For was not the renovated road being officially opened. Those who had occasion to use the wretched apology for a modern road in recent years were astounded when gliding over the smoothly tarred surface of the re-modeled thoroughfare. The ruts and the puddles, the holes and the spring breaking. projections were gone. Instead there was a long ribbon of asphalted track, stretching for nine miles and ten chains free from bumps and wrinkles literally beseeching the motorist to “come along and try me.” What was once the bug- bear of the tourist has been transformed into one of those glazed top stretches which make motoring, whether it be for pleasure or for commerce, a thing of joy. The opening ceremony was performed in Parramatta Park, by the State Governor, Sir Walter Davidson. Around him were parked the 1,000 cars which after assembling in the Sydney Domain had traversed the fourteen miles to the historic town. The Governor’s speech was one of those gems with which he frequently adorns official, and semi-official functions. Behind the barrage of humor which Sir Waiter dropped from his elevated stand, were some seriously worded injunctions on the subject of the need for good roads. “This time I have come to Parramatta in comfort,” began Sir Walter, amidst reminiscent laughter. 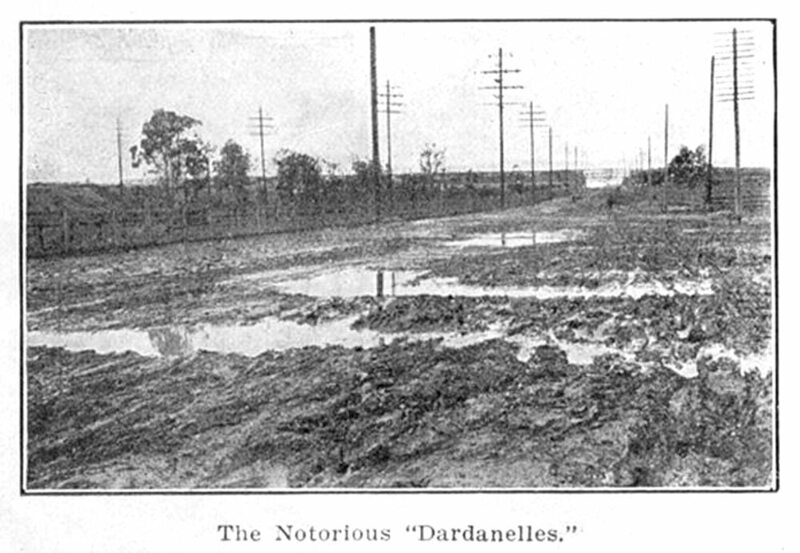 “There was no fear that whilst crossing the ‘Dardanelles’ water would come over the carburettor. And now I hope that being bogged is a thing of the past” The road has been admirably made and is a very fine specimen of Australian handiwork. Whatever the Government did, it did well, but sometimes it look rather a long time about it. 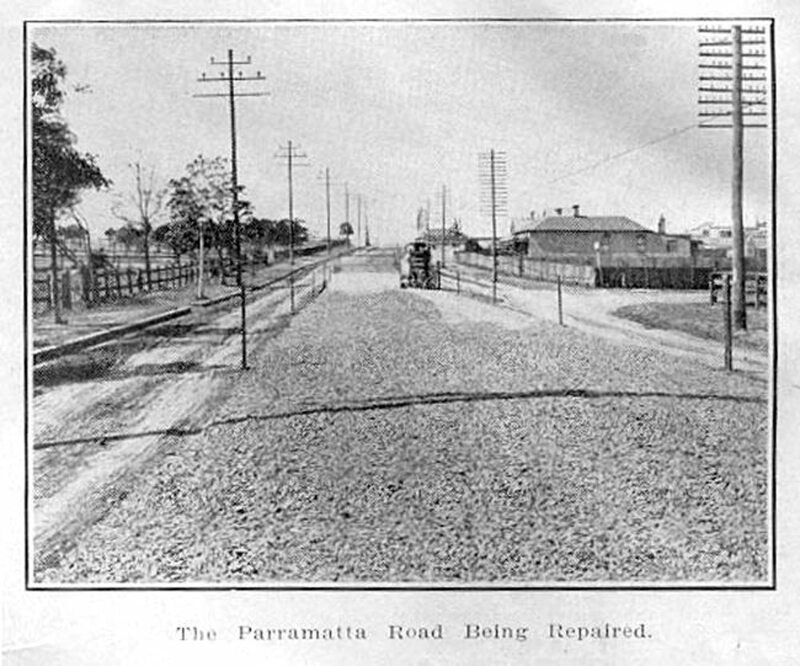 Hence he strongly commended the Parramatta Road Improvement League, and the societies which were agitating for good, trunk roads, and trying to induce the Government to push on with the improvement of the main roads. “Of course,” commented the Governor, “It is everybody’s fault but the Government’s. I agree with that. The first serious charge that could he made against the Government was in 1854, when there was a. very strong protest in Parliament about the shameful state of the Parramatta Road. But I have been reading over what has been happening in Parliament during the ten years they have taken over the Parramatta Road, (whilst we had to go round by Ryde), and I know the number of cooks who have been making a broth of the road. There are 15 municipalities along the route, and one never answers letters. (Not this). The Governor was welcomed by the Mayor of Parramatta (Alderman Simpson). Other speakers included Messrs. Morphett (president of the local Chamber of Commerce), Strudwick (vice- president of the, Parramatta Road Improvement League), D. M. Cooper (chairman of the Roads and Tourists Committee of Royal Automobile Club), F. Cridland (president of the Master Carriers’ Union), and S. L. Tyler (president of the Motor-Traders’ Union). The. speech of Mr. J. T. Lang, (State Treasurer), contained some news of interest to motorists. It was, in brief, a scheme to put in order the main roads of the County of Cumberland. This will he the beginning of a proposal to re-condition the whole of the roads of the State. In announcing the scheme the Treasurer said that the ?500,000 necessary to repair the main roads of the County of Cumberland would be raised by local loan. It would carry interest at the rate of five and a half per cent, free of State and Federal-income tax, and would have a currency of ten years. The extended scheme to cover the whole State would be embodied in legislation to, be submitted to Parliament early next session. Reverting to the County of Cumberland proposition, the Treasurer said, that in conformity with the Government’s decision to raise the half million of money it had been resolved to enlarge the scope of the Main Roads Bill introduced last session -extending the area it covered. In last session’s bill the scheme stopped practically at Parramatta. It was now proposed, with the consent of the Minister for Local Government, to extend its scope right throughout the County of Cumberland. . The proposal would embody the re-conditioning of the South Coast, the Great Southern, the Great Western , and the Great Northern roads. 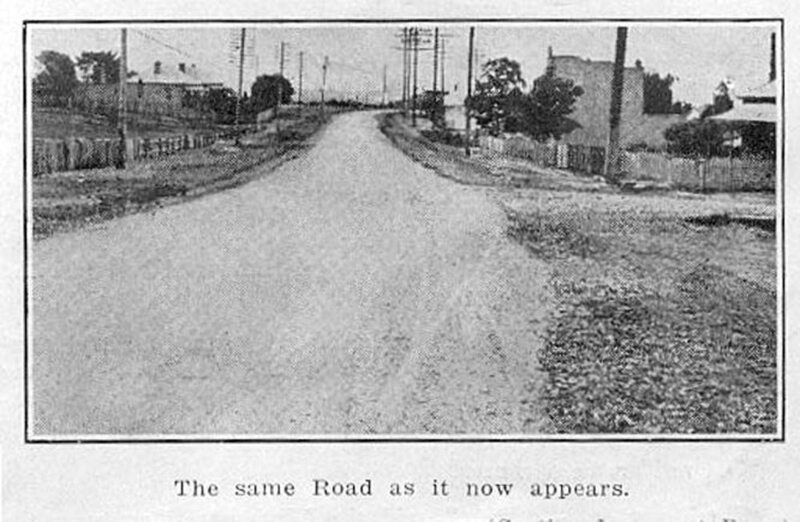 That would mean, that the roads from Sydney to Bulli, from Sydney to Campbelltown and Camden, the Parramatta road from Parramatta along the Woodville road to the Great Southern road, and the one from Sydney to Wiseman’s Ferry, the four main arteries leading from the city into the interior would be put in the same excellent condition as the stretch of re-made thoroughfare from Sydney to Parramatta. The Government, he pointed out, had well carried out the re- construction of the Parramatta-road, and he could urge with confidence the people -the motor traders, the automobile people, the master carriers, everybody- to get behind the Ministry in this new proposal. That ?500,000 was essential. The local government authorities had worked out the plans and the method of construction, and he had arranged with the Minister for Public Works that the work should not be stuck up because of the lack of, blue metal, so that everything was ready waiting for the necessary money. The arrangement with the Minister for Works was that the State quarry at Port Kembla should temporarily put more men on and set its crushing plant to full capacity, thus supplying 170,000 tons of blue metal a year. That would enable the work to be pushed ahead expeditiously, and at the same time would be the means of stopping the complaints of municipal councils about the lack of supplies of blue metal for all ordinary purposes. The expenditure for the first year, he explained, would total about £180,000, but after that, as more extensive plant was secured, the rate of expenditure would be increased.” It was explained by the Treasurer that the loan would really be part.of the recent £3,000,000 flotation. This loan was not fully subscribed, and would now be re-opened, but the £500,000 would be specially earmarked for the County of Cumberland roads. The Minister for Local Government (Mr. T. D. Mutch) then vigorously replied to a suggestion by Mr. Cooper (of the Automobile Club) that the whole of the revenue gathered from the motor tax should be put in a main roads fund and spent on the upkeep of the State’s thoroughfares. “Oh, no!” came a chorus. Mr. Mitch proceeded to surprise the crowd by the announcement that in re-conditioning the Parramatta road the Government committed an illegal act. “Yes, an illegal act,” he declared. The measure amending the Main Roads Bill passed last session so that it would cover the roads of the whole State, he added would be introduced into Parliament in a month or two–as soon as the House met. The only trouble was that some people were misrepresenting the position to the. councils. He asked them not to rush in urging opposition to a measure before they knew what was. in it. That was the sort of thing calculated to harass the Government. Neither of the Ministers stated what amount of money would be necessary for the latter project or by what means it was to be raised.